We have talked about the origin and the principles of Design Thinking in past blog posts. But how do a company really use the design thinking approach to redefine a service or a product? Here an interesting example at GE Healtcare. Medical procedures can be scary for patients, and medical personnel are often wrapped up in the technical aspects and emotions can easily be ignored. To improve the user experience for both patients and doctors, GE Healthcare has set up a team of 60 design thinkers. The first step in the GE process was to observe each step in the process of a medical procedure. Often, when users are asked to describe the process, they leave out crucial parts of it, because they don’t notice they are doing certain things, such as fumbling with wires and tubes. Once the process is mapped out and the problems are pinpointed, it’s time to look for solutions. Empathy for the patients was the first step toward understanding how they felt during the process. The team came up with the idea of making medical equipment look more like everyday objects, to reduce the disconnect. An MRI machine was designed to remind patients of open hands, in order to install calming feelings. The inside of the device can be decorated subtly with patterns and shapes, so patients have something to look at while the exam is going on. Some MRI devices offer the patient a choice of various musical backgrounds, visual scenery and mood-lighting. Offering the patient a choice gives him some control in a scary and uncertain time. Bob Schwartz, General Manager of Global Design and User Experience at GE Healthcare, partnered his design thinking team with students from the Milwaukee Institute of Art & Design (MIAD) to innovate specifically in the field of breast cancer. One innovation was a hospital gown that looks more like clothing and can be worn around and outside of the hospital without embarrassment. Another design eliminated the need for intravenous poles, encasing the device inside a transportable bag. This makes it easier for cancer patients to be mobile inside the hospital. Schwartz has said that the success of his team is due not only to creative thinking, but to an organizational atmosphere, in which ensembles of people work together and hierarchy is non-existent. The team uses techniques such as ideation and theatrical improvisation to get the creative juices flowing and to spark their imagination. 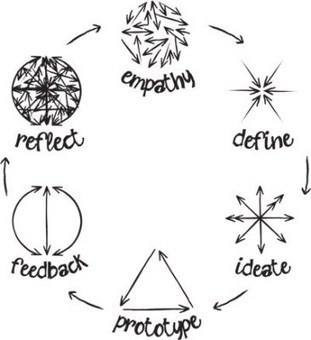 ← How to use empathy as part of a design thinking approach?